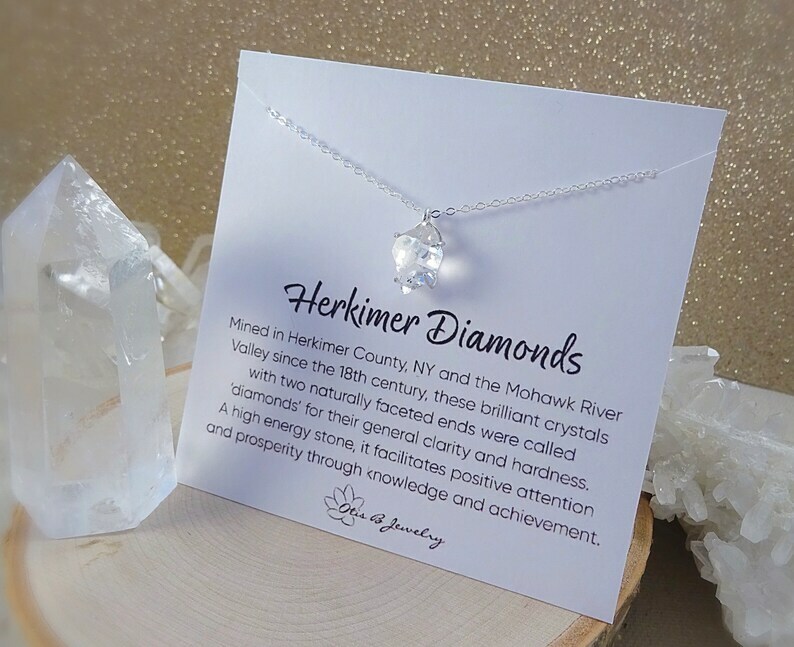 .Herkimer diamonds are actually super clear, double terminated (meaning the stone has two distinctly pointed ends) quartz crystals that are found in only a couple of places on earth! Their incredible sparkle makes them super eye catching and their colorless appearance makes this necklace easily wearable every single day. The stones are all approximately 1/2” in size and are simply placed in a rustic prong setting that accommodates their freeform shape and is suspended in perfect singularity from a shimmering flat cable chain that twinkles with every twist and turn. The chain may appear delicate, but it is very strong and highly durable. Necklace lengths are available from 16-20" at no change in cost. The length shown in the photo is 16”. You may select your favorite length from the drop down menu. 14k Gold filled and sterling silver finishes are available for this style. Both metal finishes are heirloom quality, meaning they are nickel free and safe for even those with sensitive skin. The metals will never chip, flake, peel or cause skin irritations or discoloration. This necklace is wearable every single day. The clasp is a lobster claw closure that is flanked by tiny freshwater pearls for an elegant finishing touch. 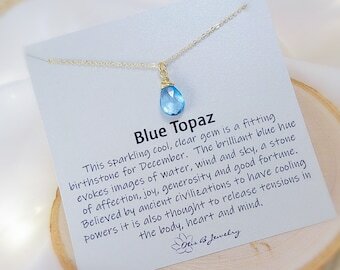 PLEASE NOTE, these are all VERY unique stones with individual shape variations that make them truly one of a kind. Your necklace will arrive gift boxed and ribbon wrapped, along with a storage bag, care instructions and a jewelry cleaning cloth. Absolutely gorgeous!! They go beautifully with so many outfits and make even jeans and a tee look polished. Thank you! The leaf is gorgeous but the smaller studs do not sit straight, they are too short for this earring and hang on a slant. We happily accept all credit cards via Etsy Direct-Checkout. Direct Checkout is completely safe and secure. We do not see your billing info, credit card numbers or information regarding your financial institutions. 1) Due to the time and effort required to create/package and ship higher quantity orders (4+ items), and the various hands involved in each bulk order, we do not allow returns on bulk orders. We will allow for exchanges only. Should you have any doubts of style/color of your bulk order, we recommend that you would please refrain from purchasing in larger quantities until you've had a chance to review a single item first. by ordering only one of the item/s and then ordering the rest if you are satisfied with the product. 2) Returns are allowed on UN-WORN, NON-PERSONALIZED items and orders that have not been purchased in larger quantity, within 2 weeks of receipt. We can not allow returns on personalized jewelry unless there has been an error on our part. Any refunds are issued, minus shipping and handling charges, and a 15% re-stocking fee, in the form by which the item was paid. 3) We must be contacted via Etsy for authorization for your return, please do not simply send the item back, communication is extremely important. 4) Returned item/s must be received back to us in the same condition in which is was shipped, within one week of the item's delivery. Please be careful to pack the item so as to avoid chain tangling, broken stones or any other defects that can occur during shipment. If the item arrives back to us in irreparably damaged condition, an additional fee may be incurred. 5) If you wish to exchange an item, this must be done within two weeks of receipt. Please contact us before shipping the item back for a return authorization. 6) If an item happens to break within one month (30 days) of the purchase date, we will gladly repair the item at no cost. 7) Pricing adjustments are not made on orders that have been purchased before the beginning of a sales event. 8)We can no longer cancel orders once they are placed, if there is an issue or concern with our order kindly contact us! We here at Otis B are dilligent to ensure that every piece that leaves our workshop is accurately designed according to specific requests, the components are secure and in perfect condition and any gemstones are free of (unnatural) flaws or defects. *** We sell nothing but high quality, 100% STERLING SILVER jewelry. If an order is shipped and then sits untouched for weeks or months at a time, tarnish does occur. Tarnish is a natural chemical reaction to the surrounding air and happens with even the most expensive designer sterling silver jewelry. For this reason We always try to schedule wedding orders to ship about three weeks before the date they are needed by so the jewelry is not sitting for lengthy periods of time and we always include professional polishing cloths in every order to remove any tarnish that might occur. Tarnish is especially prevalent in the summer months and during lengthy international transits. All charms are hand stamped (or hammered), in house, by two trained stamping professionals. The impressions are created by hammering an iron stamp onto a blank charm with a brass head mallet agains a solid steel block. Please note there will be a slight impression on the opposite side of the charm and this impression is a normal byproduct of the stamping process and not in any way a flaw in your jewelry. ***Our current production time (1-4 Business days typically) does not include shipping time. Please review shipping estimates below to get a better idea of when to expect your order. We use USPS for shipping, if you require another handling option, kindly let us know prior to purchase, additional shipping charges will apply. *International First class can vary greatly but typically runs about 1-2 weeks transit time. Tracking information is not available for such packages once they leave the US. *Domestic Priority transit time averages about 1-3 business days depending upon your location. *International Priority transit time averages about 1 week, these parcels ARE tracked. All domestic packages are tracked. We ship to the address we are given in checkout and are not responsible for mis-keyed addresses or errors made by the buyer in checkout or the misdirection of packages due to incorrect address entries. By law we cannot check "gift" on customs form under any circumstances. This practice of falsifying documents is illegal and could result in the loss of our business license. Please do not request this of us. Thank you for your understanding. Fees incurred by international packages being returned to the US due to insufficient/incorrect addresses OR not being collected in time at destination will be the clients responsibility and must be paid before the item will be reshipped. International customers are responsible for all fees that may be imposed by their country of residence, including import taxes, customs duties, and fees levied by the buyer's country. These are not extra postage fees, and we the seller are not responsible for these fees. Additional charges for customs clearance must be borne by the recipient; We have no control over these charges and cannot predict what they may be or if they will even be requested of the buyer. Customs policies vary widely from country to country; you should contact your local customs office for further information. When customs clearance procedures are required, it can cause delays of weeks or months. All international orders will have a value declared on customs forms - no exceptions. ***We do not sell our display cards without our jewelry. We do not sell gift boxes or packaging. All of our stones are 100% all natural, not lab created, and are subject to some natural flaws and inclusions, please be advised that these are not "sub par" by any stretch, just unique and beautiful, the way nature made them. ★ Follow us on Facebook for special deals, sales and giveaways! Many of our products are available with customization and personalization options. Often we will require the customization requests be notated in the message to seller box in checkout as Etsy only allows two drop down menus per listing. It is important to specify any chain length, initial, gemstone, or display card requests in checkout if you do not see a dedicated drop box menu for these options. We are ALWAYS happy yotr alter an item to your specific needs upon request, just let us know what you'd like in checkout notes! Absolutely ALL of our products leave our shop in sturdy gift boxes and our signature wrap. We also send along care instructions, a storage baggie and a handy polishing cloth for general maintenance of your jewelry. **What is gold fill? : Gold filled jewelry is NOT the same as gold plate. Gold filled jewelry contains a much higher amount of pure gold than plated products. Gold filled jewelry is wearable for a lifetime, while gold plating will wear away over time with consistent use. Gold filled jewelry is a safe option for those who have metal allergies. Gold filled jewelry is nickel free. **Is your silver jewelry sterling silver? : YES! We sell sterling silver and gold filled jewelry only, unless otherwise noted, in an effort to offer the highest quality, sustainable products that can be enjoyd for a lifetime. Our current processing time is about 5 business days or less. This does not include transit time. Please note that larger orders may take a touch longer. If you are needful of your items within a short period of time, or by a specific date it is VERY important to let us know this in the message to seller box in checkout, or via Etsy conversation. We LOVE our bridal clients and are honored to be a part of your big day! If you are ordering for your wedding party, or any other event that calls for a larger quantity of jewelry (3+ items), then we offer a couple of discount options for you. 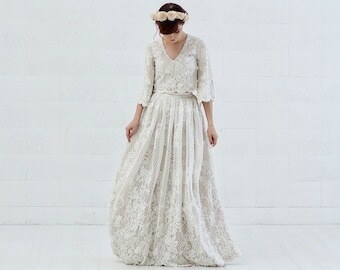 If you are ordering 3-5 items, you may use the code BRIDAL10 for 10% off your purchase. If you are ordering 6+ then you may use the code BRIDAL15 in checkout for 15% off. Please note that improper use of these codes may result in the delay or cancellation of your order. Made in the USA, But Ships Globally! All of our products are crafted by hand, in the USA. New Jersey to be exact, and we are very proud to ship absolutely anywhere on the planet! Please click on shipping options to view all postage pricing specific for your corner of the world. We are happy to answer any and questions regarding our products and services. 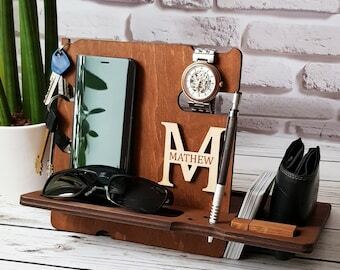 If you contact us directly through Etsy's message system you can typically expect a response within a few hours unless it is during our busy spring or holiday season, in which case your questions will be responded to within 24 hours. 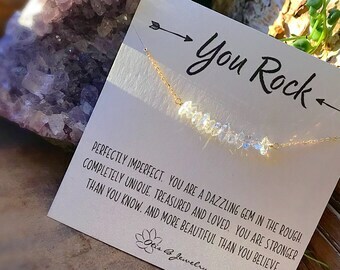 When messaging us via Etsy, you will be speaking to either Andrea, our dedicated customer service rep, or Darrah, the owner of Otis B Jewelry. Absolutely all of our gemstones are natural and created by Mother Earth, not a lab technician. So, this means that each gem will be completely one of a kind, and may have some minor inclusions or cleavage that is both normal and natural and makes each piece perfectly unique. We are very careful to not send stones that are damaged, meaning, we do not send stones that have large chunks missing or gashes. We hand select each stone based on visual appeal and are confident you will adore them as much as we do. Why Buy From Otis B? 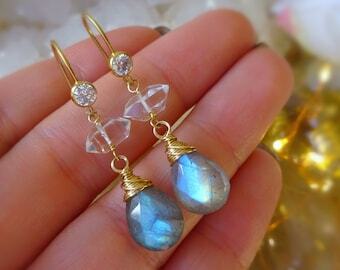 Otis B Jewelry is a small business, located in New Jersey, that began on Etsy shortly after its inception. We've enjoyed over 80,000 transactions with exceedingly happy customers (check out our feedback!) between two Etsy shops for 8+ years, both with 5 star ratings. Our customer service is dedicated to making sure you have a pleasant buying experience and that your order is everything you wished for and more. Returns, exchanges, alterations and repairs are painlessly and easily facilitated through our customer service department. 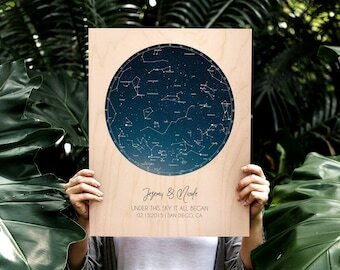 All of our display cards are original designs that have been carefully thought out and created by Darrah and Johanna. Any similar cards you see on Etsy are copies. We love and appreciate every buyer, Thank you!